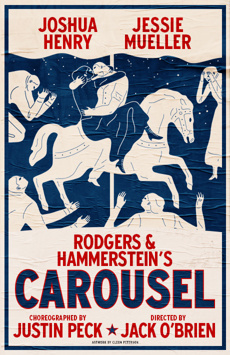 Rodgers & Hammerstein’s Carousel has returned to Broadway, directed by three-time Tony winner Jack O’Brien, with choreography by New York City Ballet’s Justin Peck, and starring Tony nominee Joshua Henry, Tony winner Jessie Mueller and four-time Grammy winner Renée Fleming. The New York Times raves, “this ravishing Carousel tingles with the rapture of life in all its contradictions.” With a score full of “the theater’s most beautiful and enduring songs” (Variety), this story of passion, loss and redemption is “one of the most moving experiences in all of musical theater” (New York Magazine). “God is in Carousel,” raves The Chicago Tribune. “It’s the greatest musical ever written.” Don’t miss the ecstatically acclaimed revival NPR calls “the best musical of the season, by far."